Curated by Carly: Double giveaway week: Bridier Baubles & Southernly Stated! Double giveaway week: Bridier Baubles & Southernly Stated! Since my giveaways have been so responsive lately, I decided to host TWO giveaways this week! The first giveaway is for this "Cece Stack" bracelet from Bridier Baubles. This is the newest addition to their bracelet collection; I just love the multiple-stack look of this single bracelet. It looks good alone or would make a great companion for your other favorite bracelets! Check out the Bridier Baubles website to view all their other designs. I'm a big fan of their bangles and earrings! For the second giveaway, I partnered with Southernly Stated to get you totally prepared for tailgating season! 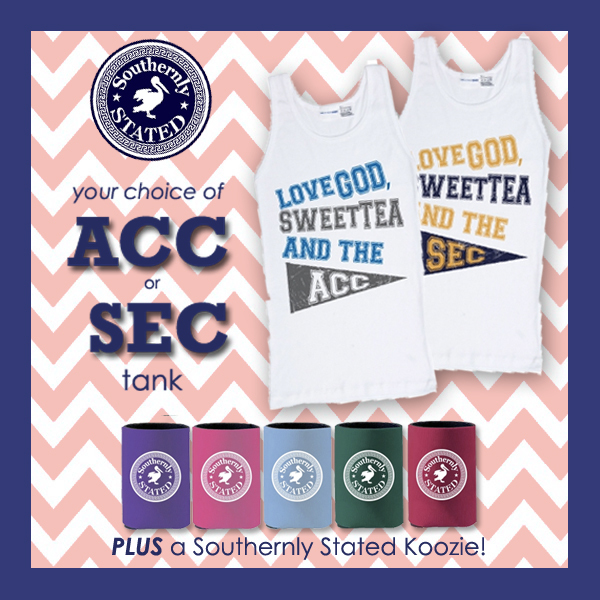 Enter this giveaway for your choice of ACC or SEC tank & a Southernly Stated koozie! Enter both giveaways by Sunday night for your chance to win! Sign in using Facebook or your email to use Rafflecopter. Don't worry - it won't post to your Facebook wall or access your information! I like the Grits, Grace, and Gossip design! I would wear the bracelet to chapter meeting! It's so classy! My favorite SS design is the grits grace and gossip!! 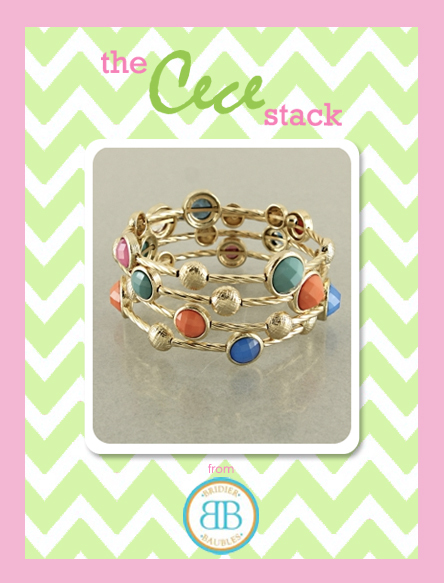 I think the Cece stack bracelet would make my daily arm party. So, during the day with tee and shorts and at night with my cute dresses. I would wear the cece stack to my cousin's wedding! I love the SEC tank! I would wear it everywhere, especially on college football Fridays! This Southern girl approves! I love all of SS's t-shirts! and of course I would wear the Cece stack bracelet with my SEC tank! I adore the SEC tank. Southerners love their SEC football! I love the America tshirt from Southernly Stated! I would wear the Bridier Baubles bracelet out for a day of lunch and shopping. I'd wear it to work with a chic outfit! I would so wear it for a date party! I am obsessed with the ACC tank! Too cute! I love your blog! I'm a fellow Chicago prepster as well! I'd wear the bangle for a night out with a cute dress! And I love the Grace, Grits, and Gossip tank..very Southern. I love the bangle, I would wear it anywhere--errands, club meetings, church, date night. I'm a Gamecock girl, so I love the God, Sweet tea, and the SEC tank! I love the bangle - it would definitely dress up some of my outfits I wear to work at my PR internship! Love "Grace, Grits, and Gossip!" My favorite is the ACC tank! I neeeeeed this for my senior year! i'd wear the stack tailgating! and acc for sure! I'd wear the stack tailgating, and deff acc!